2017 Stuttgart winners Michael Jung and Corazon. Photo courtesy of Stuttgart German Masters. The European indoor season kicks off tomorrow at the Stuttgart German Masters, and top event riders from seven different countries are making the trip to Germany to compete. With eight-time Stuttgart winner Michael Jung sidelined with a broken arm following his fall at Le Lion d’Angers, the stage is set to crown a new champion this year. Fans of Tiana Coudray‘s London Olympic mount Ringwood Magister will be delighted to see him representing the U.S. at Stuttgart — his first major appearance since the Rolex Kentucky Three-Day Event in 2016. At 17 years old, “Finn” is still looking fabulous. We are also thrilled to see 18-year-old Tom Bombadill Too on the entry list with Brazil’s Ruy Fonseca. 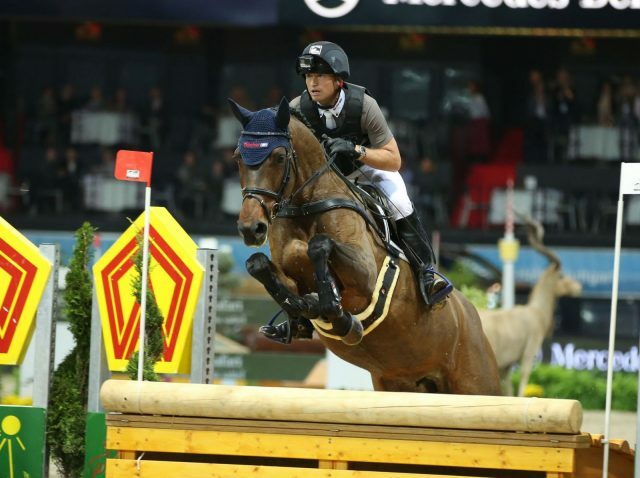 “Tommy” won individual bronze at the 2015 Pan American Games and represented Brazil at every major championships from the 2010 World Equestrian Games to the 2016 Olympic Games. Newly crowned world champion Ros Canter is also slated to compete aboard Las Vegas, who stepped up to three-star level last year. Fellow Brit Laura Collett will also compete with Parkfield Quintessential. Imogen Murray will ride Shannondale Vintage, who just stepped up to CIC3* level at Blenheim. Germany has a formidable lineup led by Tryon individual bronze medalist Ingrid Klimke, Andreas Dibowski, Peter Thomsen and Niklas Bschorer. Ingrid Klimke‘s mount Parmenides competed up to the three-star level of eventing and has spent the past few seasons competing in pure show jumping. He has competed in the CSIO5* at Aachen for the past two years and is a strong contender at Stuttgart. Jesse Campbell will also represent New Zealand with his two-star mount Diachello. Regis Prud Hon is the sole rider representing France with his Badminton mount Kaiser HDB 41 75. Julien Despontin will also represent Belgium with Quick Fiddlestick. The indoor eventing derby at Stuttgart will stream live tomorrow, Nov. 14 on ClipMyHorse.TV starting at 9:35 p.m. CEST/8:35 p.m. BST/3:35 p.m. EST. Click here to access the live stream. Click here to view the full Stuttgart entry list.